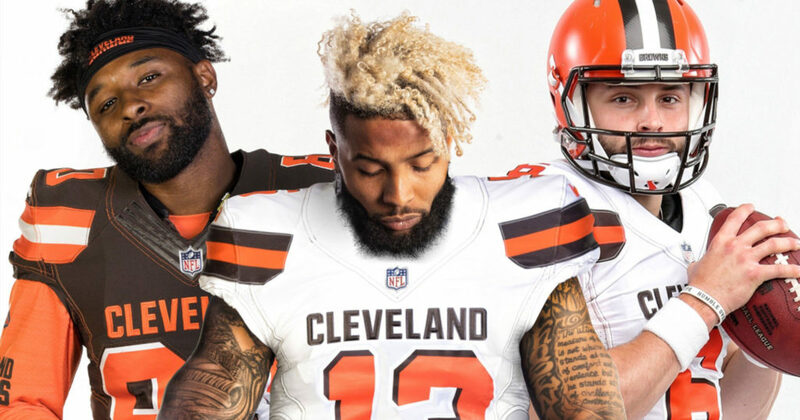 If the NFL offseason wasn’t crazy enough already, the New York Giants and the Cleveland Browns did everything to make it even more insane. This past week, New York shipped off All-Pro, superstar wide receiver Odell Beckham Jr. to the Browns, in exchange for the 17th overall pick in this year’s NFL Draft, a third rounder, and 2017 first round pick Jabrill Peppers. Beckham Jr., who turned 26 this past November, signed a 5-year/$90 million contract extension with the Giants last August. In 12 games this past season, Beckham racked up 77 receptions for 1,052 yards and 6 TDs. Despite ankle and quad injuries that have held out the uber-talented receiver from a portion of games over the past two seasons, Beckham’s unstoppable playmaking ability create a dominant individual who can take over football games and one that Cleveland will be able to utilize for the remainder of his prime. For the Cleveland Browns, this trade was a no-brainer, as they acquire a generational offensive talent who can stretched the field at any time, a major need for the Browns heading into this offseason. After drafting quarterback Baker Mayfield with the 1st overall pick in the 2018 NFL Draft, Cleveland went 7-8-1 this past campaign, which many believed to be a booming success, considering that the team went 0-16 the year before. The addition of Beckham Jr. gives Mayfield another weapon to incorporate into his arsenal, to go along with Pro Bowl receiver Jarvis Landry, tight end David Njoku, and second-year pass-catcher Antonio Callaway. The Browns also signed former All-Pro running back Kareem Hunt earlier in the offseason to a one-year contract after he was released by the Kansas City Chiefs in November. While Cleveland was expected to draft an interior defensive lineman with their first-round pick that now belongs to the Giants, they filled that void by signing defensive tackle Sheldon Richardson to a 3-year/$39 million deal. Their Super Bowl odds shifted from 25-1 to 14-1 after their trade for Odell Beckham Jr, making them also the favorites to win the AFC North. Second-year GM John Dorsey has quickly built one of the NFL’s most formidable offenses, already making his case for Executive of the Year. On the flip side, the trade for Beckham places the Browns in full win-now mode, putting a lot of pressure on Baker Mayfield and first-year head coach Freddie Kitchens, as Cleveland finally has an extremely competitive team that can be successful sooner rather than later. With plenty of mouths to feed on the offensive side, it will be very interesting to see the long-term ramifications for the acquisition of the superstar wideout. New York is coming off a 5-11 season, in which star-rookie running back Saquon Barkley won Offensive Rookie of the Year honors but was the sole bright spot, along with Beckham, for a team that struggled immensely to put wins together. 38-year-old quarterback Eli Manning remains at the helm of the offense, but the Giants are expected to prepare for the future and draft a quarterback in April. Not all is lost for the Giants. The mid-first round pick acquired in the trade could be valuable to draft a skill-position player or could be used to move up in the draft order to get Gettleman’s franchise quarterback of choice. Jabrill Peppers has shown some promise as a safety and has plenty of potential to develop in the future. The long-term impacts of this trade are yet to be seen, and will presumably decide the major winners and losers in this situation. The Giants, in the process of trading away one of the best receivers in the NFL, will pay for his salary for the 2019 season and take a cap hit of $21.5 million for this upcoming campaign. Cleveland is expected to restructure Beckham’s contract, as he hopes to enter Antonio Brown’s territory in terms of annual salary and re-establish himself as the highest-paid wideout in the league.